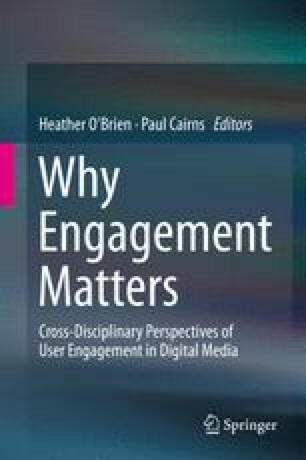 This chapter examines user engagement in interactive information search systems, drawing upon research in information retrieval, information behavior, and human-computer interaction. The authors describe small-scale, laboratory-based studies and large-scale, online search studies to illuminate the factors of systems (e.g., architecture), users (e.g. individual differences), and tasks (e.g. degree of complexity) that impact engagement outcomes. Throughout this chapter, the range of self-report, behavioral, and physiological methods that inform information search engagement research, along with their benefits and limitations are discussed. The authors argue that engagement is central to search success but that studying search engagement is challenging due to the number of factors that impact information search. Mixed methods approaches that combine subjective and objective measures can equip researchers to meet these challenges.